Dead Alive is bloody. Very, very bloody, and the brainchild of the one and only, Peter Jackson. This Kiwi production is a bloody good time. A soothsayer foretells the pairing of a cute bodega worker Paquita and a middle-aged nebbish Lionel. The latter’s overprotective mother Vera Cosgrove (Elizabeth Moody), spies on their date as they visit the Wellington Zoo, which features a very special exhibit: a Sumatran Rat Monkey. The monkey is a hybrid creature, the offspring of invasive rat species getting it on with monkeys. Anyway, one of the creatures bites the overbearing mom, turning her into a crazy zombie. Lionel tranquilizes her and keeps her in the basement, but not before she’s bitten and transformed others into mindless zombies. Soon after that, ALL HELL BREAKS LOOSE. The climax is one of the bloodiest things we’ve ever seen. 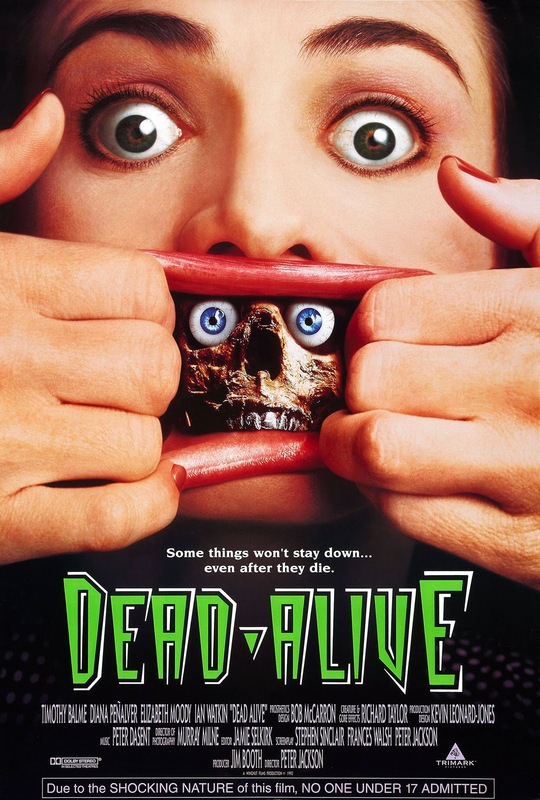 Check out Dead Alive. It’s one for the ages.